Editor’s note: Occasionally we receive press release from artists’ representatives that we think would be of interest to our readers. This is such a release. 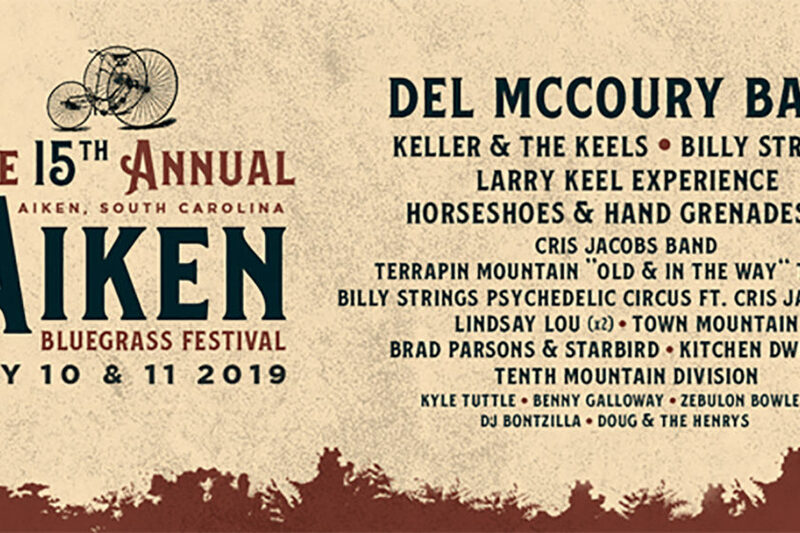 February 5, 2019 – Aiken, SC – Bluegrass royalty, Del McCoury Band, will headline the 15th Aiken Bluegrass Festival on May 10th & 11th in Aiken, SC. The two-time GRAMMY winner, celebrating his 80th birthday this year, is at the top of a bill that brings the three-stage festival back to the roots of bluegrass, while simultaneously celebrating the bright future of the genre. The full lineup includes red-hot Billy Strings, Keller Williams’ string band collaboration, Keller and the Keels, the 14th ABF appearance of Larry Keel Experience, hard-driving Horseshoes & Hand Grenades, groovy and soulful Cris Jacobs, the dynamic voice of Lindsay Lou, and rowdy North Carolinians, Town Mountain. Brad Parsons & Starbird, Kitchen Dwellers, Tenth Mountain Division, Kyle Tuttle Band, Benny Galloway, Artist-at-large Zebulon Bowles, DJ Bontzilla, and Doug & The Henrys round out the lineup. In addition to performing, Benny Galloway will return as main stage emcee, along with new emcee, Kyle Tuttle. The Aiken Bluegrass Festival is known for unique collaborations and this year is no exception as Billy Strings’ Psychedelic Circus returns with help from the Cris Jacobs Band. In addition, ABF will host Terrapin Mountain for the “Old and In The Way” tribute, a special-guest-loaded full band set from Kyle Tuttle, and the new and improved Campfire Stage, hosted by Benny Galloway, will host performances right in the campground. The festival will be held at the Western Carolina State Fairgrounds (561 May Royal Drive in Aiken, SC) and is conveniently located close to many major cities; a less than 30-minute drive from Augusta, 2.5 hours from Atlanta and Charleston, and 3 hours from Asheville. On-site tent camping is available, as well as a deluxe RV areawith power, water, and sewer. Primitive RV sites (no hookups) are also available. For those not wishing to camp, the city of Aiken has many lodging options at a variety of price points. For more information on camping, which is separately ticketed, please visit the ticketing tab on the ABF website. The kid’s area, a festival favorite for many families last year, is back again with an expansion of the bouncy house playground, providing additional activity areas for music fans of all ages. Stay tuned for a complete list of food and drink vendors, satisfying vegans to carnivores, and details on the craft vendors that will be on-site. Applications are now being accepted, click here for more information. Gates to the fairground open at 10 am and main festival gates will open at 2 pm on Friday, May 10th. Tickets are on sale now at www.loveabf.com and in the Aiken area at The Alley Downtown Taproom. Buy early to take advantage of Early Bird pricing on GA wristbands as pricing increases after Feb. 14th. A limited number of LOVE VIP packages are available, perks include early entry (Thursday) camping, 2 private cash bars, side stage viewing areas, a backstage Bloodys & Brunch event (with an acoustic performance and a catered meal/open bar), and a VIP-only screen printed festival poster. The Aiken Bluegrass Festival was started 15 years ago by Steve and Jeannie Groat as a fundraiser for a local therapeutic horseback riding program, Star Riding. We are happy to continue that tradition this year with our partnership with Great Oak Therapeutic Riding. Since its inaugural year, the festival has twice outgrown its confines and now finds its home at the Western Carolina State Fairground. ABF has brought an array of bluegrass artists to Aiken through the years including Peter Rowan, Old Crow Medicine Show, The Infamous Stringdusters, and Greensky Bluegrass. Aiken Bluegrass Festival has its roots in traditional bluegrass and this year’s lineup boasts a bridge from bluegrass founder Bill Monroe to current and future superstars.